Figure 2-9. - Partially erupted teeth. Figure 2-10. - Single surface amalgam restorations. Double occlusal (O) (O): This restoration is often referred to as "snake eyes." Chart along the two separate grooves on the occlusal surface (fig. 2-10, tooth #4). Facial (F): Chart along the facial groove, in the facial pit (fig. 2-10, tooth #14), or at the gingival margin of the facial surface (fig. 2-10, tooth #13). Lingual (L): Chart these along the lingual groove, in the lingual pit (fig. 2-10, tooth #14), or at the gingival margin on the lingual surface (fig. 2-10, tooth #15). On anterior teeth, chart these restorations in the lingual pit (fig. 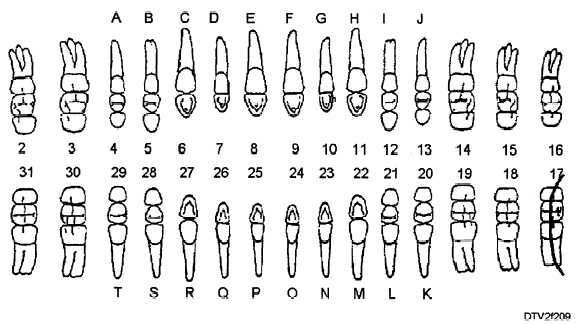 2-10, tooth #9). Mesial-occlusal (MO): Chart by beginning at the mesial surface and following the grooves on the occlusal surface to the central pit or groove (fig. 2-11, tooth #18). There can be two amalgam restorations (e.g., an MO and a DO) on the same tooth. In this case the restoration will reach into the central groove, but not include the central pit (fig. 2-11, tooth #20). Rarely will a restoration cross the oblique ridge (fig. 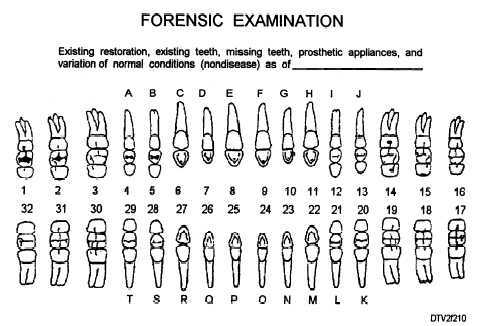 2-11, tooth #2, #3, #14, and #15).